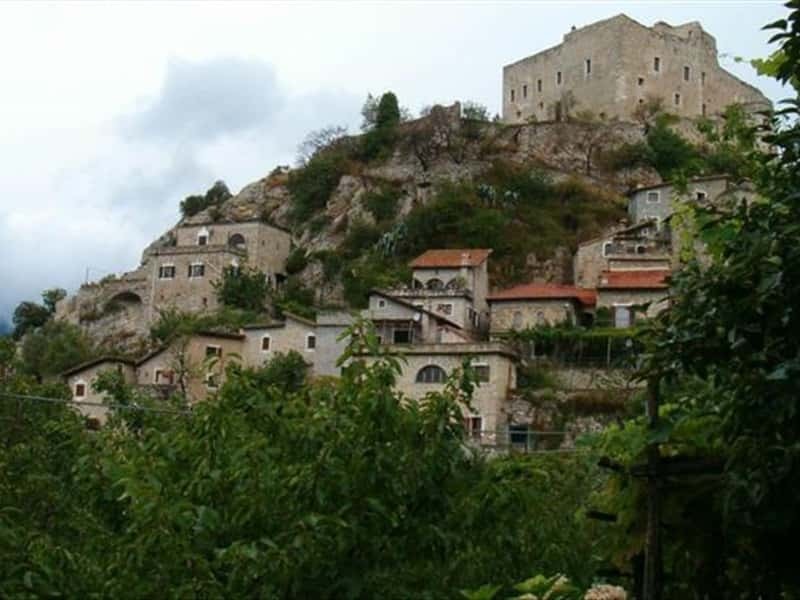 A Medieval village in the province of Savona, Castelvecchio di Rocca Barbena is located near the valley of the river Neva, at the feet of Rocca Barbena. It is situated in a dominant position and built for defensive purposes and still retains the original urban structure. The houses are dominated by the castle that belonged to the Marquis Del Carretto, now partly in ruins. The village is arranged in a compact series of buildings, that are often connected by arches that create a sort of tunnel between the narrow streets, an architectural element, that can be found in many towns of Liguria. Founded by Marquis Clavesana between the XII and XIII centuries, the village was a fief of great importance. The Savoy family bought the land in 1623 and some years later, the Republic of Genoa captured the village after having besieged the castle. During the War of Spanish Succession in 1746, it was again attacked by the Piedmont troups. Castelvecchio di Rocca Barbena became part of the Kingdom of Sardinia and then the Kingdom of Italy. The rebuilt church of the Baroque era, probably on the remains of an earlier building. It is located half way down a slope and has a Bell tower decorated with semicircular arches of 1400. The ancient castle of the Clavesana Family, built in the Middle Ages, it was damaged by the attacks over the centuries, first and foremost during the siege of the Genoese. Today it has partly been transformed and the rest reduced to ruins. The Old Town Square is very charming with a view over the village, that can be enjoyed from the road that runs behind it. This town web page has been visited 17,933 times.